Caritas Internationalis has launched a campaign with UNAIDS and PEPFAR to promote the diagnosis and early treatment of childhood HIV/AIDS in the Democratic Republic of Congo. 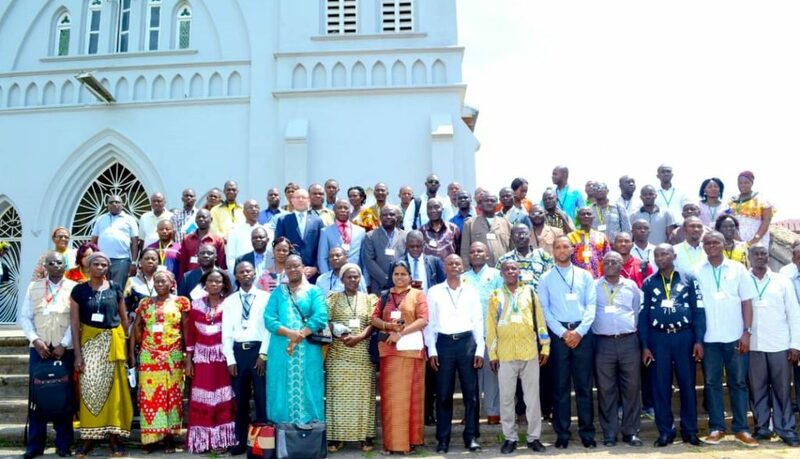 The announcement came after more than 130 religious leaders and health providers met in Kisangani on September 18 to discuss ways to better identify cases of AIDS in children and how to better mobilise communities to improve the diagnosis and treatment for children living with AIDS. “Caritas Internationalis has decided to launch a campaign in order to work with governments, international organizations, Caritas members and donors so we can ensure these children can have the best treatment possible,” said Stefano Nobile, the focal point for AIDS at Caritas Internationalis. The three-day workshop was organized by Caritas Congo Asbl and Caritas Kisangani with the support of Caritas Internationalis, UNAIDS and PEPFAR, the emergency plan for AIDS relief founded by former US president George W. Bush in 2003. Caritas Internationalis was one of the first religious organizations to tackle the fight against AIDS at a global level. In the Democratic Republic of Congo thousands of children living with AIDS have no access to suitable treatment in a country already hard hit by hunger, poverty and conflict. In 2016 UNAIDS estimated 42,145 children living with HIV needed antiretroviral treatment but 83 percent of them had no access to treatment. The number of new infections of children under age 14 is also on the rise – increasing by around 3,338 cases every year. Caritas has been working with UNAIDS and PEPFAR to find effective ways to work with those children living with AIDS. “We don’t intend to turn religious leaders into doctors, but to use them so they can fight against HIV/AIDS by sending children to their hospitals and health centres through their parents,” said Nobile, who is based in Geneva. Speaking on behalf of Kisangani Archbishop, Marcel Utembi, his vicar-general Francois Mwarabu, welcomed the initiative and said he felt pride and responsibility to help implement it. “Our commitment is to take ownership of the project and contribute to its implementation,” Mwarabu said. Caritas Congo Asbl executive secretary, Boniface Nakwagelewi Ata Deagbo, expressed his gratitude to UNAIDS and PEPFAR for voluntarily funding this project for a period of six months. The co-ordinator of DRC’s National AIDS Control Program (PNLS), Dr Olinda, called for ownership of the fight against HIV, particularly as the most vulnerable were children, not adults. “We have to protect them,” he said. Caritas Congo operates in a country where more than two thirds of the population suffers from poverty and life expectancy is only 48 years. The organization provides around 40 percent of health services to the Congolese people through 47 diocesan offices under the co-ordination of its National Health Promotion Service (SPS). It is through this network that Caritas Congo will work to assist children and adolescents dealing with HIV/AIDS with the technical and financial support of UNAIDS and PEPFAR. Caritas Congo Asbl and the Caritas diocese of Kisangani will work with religious leaders to raise awareness in communities. The provincial minister for health, Bernadette Kitambo, welcomed the latest initiative and said it would enhance measures adopted by the country’s president, Joseph Kabila, to improve the nation’s health.